Grill steaks to desired doneness on a lightly oiled rack. Set aside to rest.Grill zucchini, bell pepper and fennel until tender and well colored.Toss baby arugula with balsamic vinaigrette. Slice steaks. Choose 4 square plates. Place arugula in one corner of the plates. In next corner, make a stack of grilled vegetables. Stack slices of heirloom tomatoes and the feta cheese in the next corner and drizzle with basil oil. Season tomatoes with freshly ground black pepper. In the remaining corner, layer sliced steak between two gaufrette potatoes. Serve immediately. 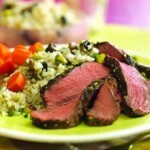 *The flat iron steak is an affordable, tasty cut of beef from the top of the shoulder blade. Long neglected because butchers must remove the heavy connective tissue that runs through the center of the meat, the trimmed steaks are tender yet flavorful. A whole flank steak is a good alternative.